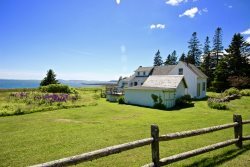 Lettie's Cottage is located on three private acres at the head of Seavey's Cove in Tenants Harbor. Very private and peaceful, the Maine vacation rental cottage is surrounded by water on three sides and is 75 feet from the water's edge. It offers easy access to the saltwater cove for kayaking, swimming and taking in the beautiful views. Accessed by a private quarter-mile driveway, the property is wooded and has a large grassy lawn sloping down to the water and well-kept gardens. Lettie's Cottage has a large central room with a living room, dining room and kitchen. The kitchen has a full-sized stove and refrigerator, a deep porcelain sink and the dining area can seat 6. There is also a picnic table at the water's edge for eating outside. The cottage is comfortably-furnished throughout and features sliding glass doors to the small deck at the front of the house. The master bedroom, with one double bed and one queen bed, occupies the second floor. There is a spacious master bath on this floor, as well as a cedar closet and great views. The house has two full bathrooms; one downstairs with a shower and one upstairs, off the master bedroom, with a shower tub. Lettie's Cottage is as comfortable for two as it is for six. Located just minutes outside of Tenants Harbor Village, the cottage is a retreat unto itself and is a perfect place to come home to after a day of exploring. Dogs may be CONSIDERED with pet fee and acceptance of pet policy. We will need to know size, breed and age of the dog. Shorter stays in the shoulder seasons may be available with a 3 night minimum. Air-conditioning: No, but fans and ocean breezes are provided! WIFI NOTE: This property does not have internet or TV service.